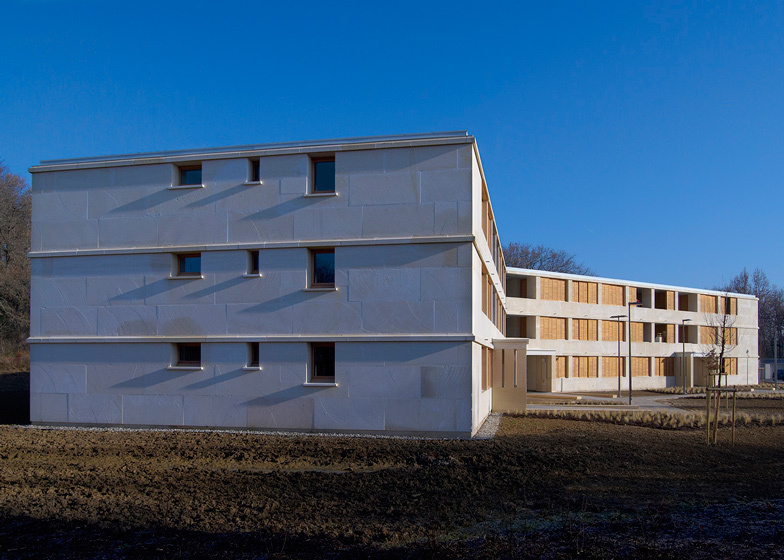 French studio Perraudin Architecture has completed a social housing complex with solid stone walls near Toulouse as part of a bid to prove that "anything that is built today could be built in stone" (+ slideshow). 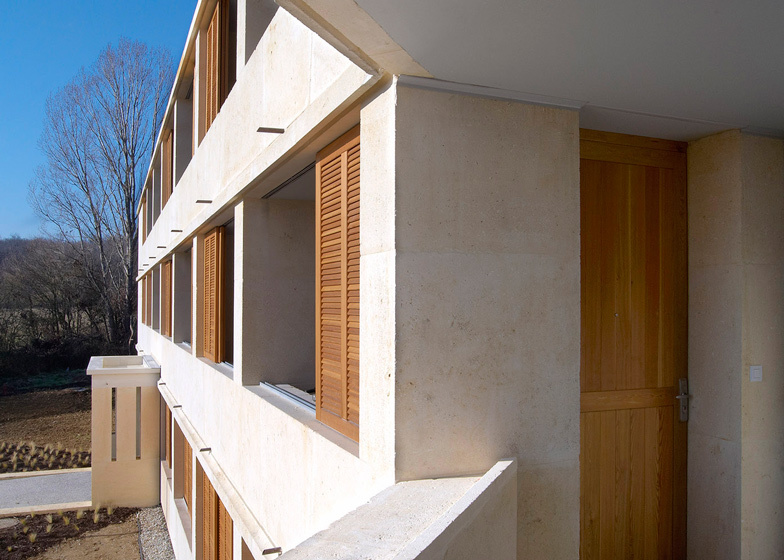 Perraudin Architecture, which also recently completed a stone house in Lyon, specified huge 40 centimetre-wide blocks of limestone for the walls of the three-storey building located within a new residential district of Cornebarrieu, north-west of Toulouse. "Stone is the most abundantly available material on earth," said architect Marco Lammers. "It is an extremely energy-efficient resource [...] and, when used with intelligence, it can be cheaper than concrete." 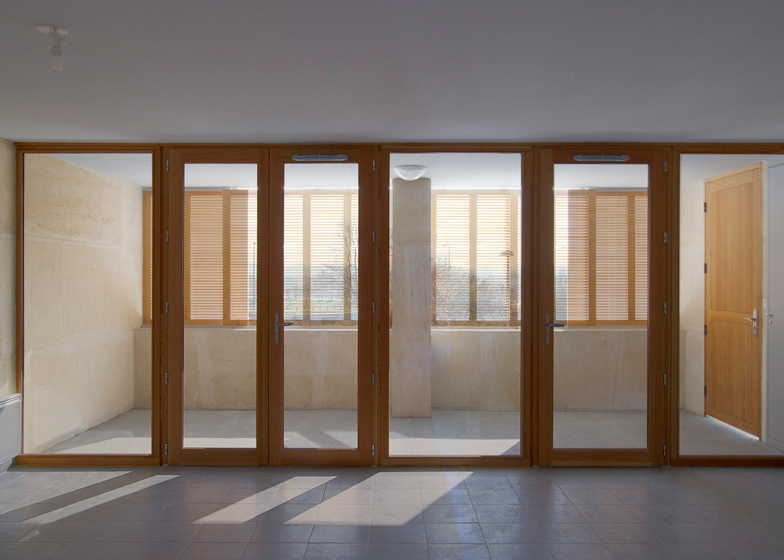 The studio treated this project as a case study to test whether stone can be used for buildings that need to adhere to both a tight budget and strict energy-saving requirements, and managed to deliver on both counts. According to the architect, the load-bearing stone walls will provide a natural air conditioning system that absorbs excess heat and releases it gradually. "The result is a truly contemporary stone architecture, rooted in the economy of simplicity and the pure tectonic art and pleasure of building," said Lammers. No paint or plaster was added to the walls, so the stone surfaces are left bare to display traces of the quarrying process. Projecting courses of stone on the exterior mark the boundaries between floors and help to direct rainwater away from the windows. A total of 2o apartments are contained within the building. Bedrooms are positioned along the northern facade, allowing living rooms to be south-facing and open out to sunny terraces. Larch was used for doors, window frames and shutters throughout the complex, and are expected to show signs of ageing over time. Perraudin Architecture is now working on the next phase of the project, which will involve the construction of a larger housing complex using the same materials palette. Photography is by Damien Aspe and Serge Demailly. Since its rediscovery of stone Perraudin Architecture has come to believe that anything that is built today could be built in stone. 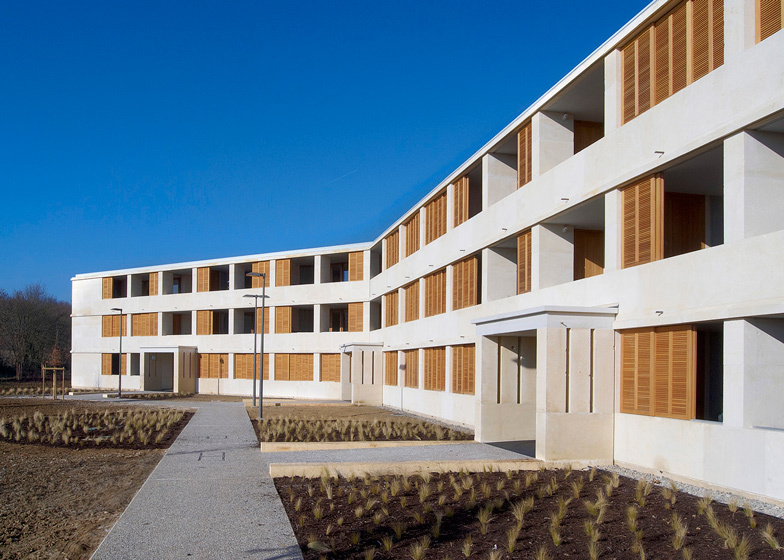 After realising several massive stone buildings - including wineries, single housing and a school campus - the opportunity to build 20 social housing units in Cornebarrieu provided an excellent test case. Is it possible, to truly build in stone within the strictest of economical and energetic restrictions? With a brief featuring both a very limited budget of 1150 euro/m² and the strict demand to be granted the label 'Very High Energetic Performance' within the French standard of High Environmental Quality? The result is a truly contemporary stone architecture, rooted in the economy of simplicity and the pure tectonic art and pleasure of building. An architecture made to age and made to last, searching to exploit to its maximum the great visual, environmental and structural qualities of its used materials. The building is entirely built up in load-bearing limestone walls of 40 cm. Precise coursing elevations define each stone, to be extracted, dimensioned and numbered in the quarry and then transported to the site. There, they are assembled like toy blocks using nothing but a thin bed of lime mortar. Each detail is a true stone detail. Large openings are formed by flat arcs with keys stones. Window sills are dimensioned in limestone. All perforations for ducts and for descending the rainwater from the roof are included in the coursing plan and carried out at the quarry. At the height of the concrete floor slabs 'cornices' project rainwater free off the building’s walls all the while doubling as guide rail for the blinds. The building is located at the outskirts of Cornebarrieu, a town within the metropolitan area of Toulouse. It is part a new residential neighbourhood extending the town towards its forested western edge. It is based on a series of simple principles, which we have come to apply and refine over time. All materials are left untreated. As much as possible, all materials are left untreated, with no paint, no plaster. The woodwork is in larch, left to age with time. The stone acts as natural air conditioning, its thermal mass absorbing and releasing surplus heat and humidity. For reasons of comfort and ventilation, the housing units are systematically continuous from facade to facade. The bedrooms are in the north to take advantage of the summer freshness while on the south side a large terrace extends the living room, with nothing but a glass wall as separation. The staircases remain in open air and to enter the apartment one enters by the loggia. Flexible blinds protect this terrace and allow it to be used as a buffer-space softening climatic variations. Life within this housing unit moves with the weather, one can activate and deactivate its great thermal mass while spaces change dynamically from being inside to outside according to the seasonal comfort. The project has been nominated for the European Union Prize for Contemporary Architecture Mies van der Rohe Award 2013, the Equerre d’Argent 2011, and was winner of the Prix Développement Durable - Concours d'architecture Pierre Naturelle 2011. Furthermore, the building has been finished within budget with its stone construction finishing well ahead of schedule. Due to this success, we are currently building the second phase of the development – 86 collective and individual housing units, partly social – using the same construction method and a budget below 1000 euro/m².